The first time was on Saturday, during the first walk with Donald James MacPhee along the Sound of Islay. She came in from Kennacraig on the way to Port Askaig and we had nice views of her in the sunshine with Jura in the background. Something I hadn't noticed initially was that if you look closely you can still make out the previous owner on the side. In particular the ‘MacBrayne’ is quite clearly visible, in the cut out on the left you can see the ‘MacB’ of ‘MacBrayne’. The letters are slightly raised (welded on?) 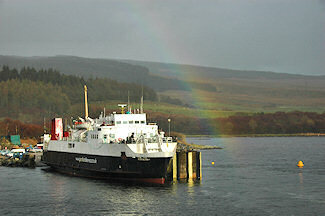 and were only painted over in black, the rest looks still pretty much as if in Calmac livery. The second time was on Wednesday during Susan's and Keith's walk on Jura. It was very hazy that day so the picture didn't turn out very well, but above you can see her with Keills on Islay in the background. The last time I saw her was at the last day during the walk at McArthur's Head, she was too far away for a decent picture though. 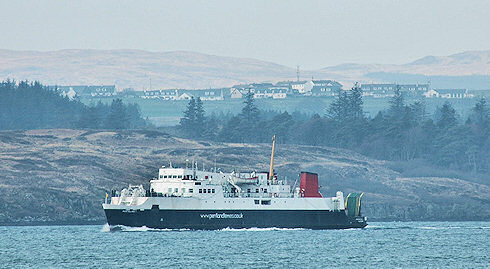 The Isle of Arran has now returned to the Islay service, so the Pentalina B / Iona has left the Islay route again. For the last time or to return again some other time?